What do you think was the best-performing email subject line of the entire federal election campaign at Dogwood? If you guessed eight exclamation points in a row and nothing else, YOU’D BE RIGHT!!!!!!!! What may have been the product of mental exhaustion turned into a surprisingly effective get-out-the-vote email in the dying days of the election. What other strange and nerdy tidbits lurk in the data? Read on! All told, Dogwood’s relentless communications team (Lyndsey, Karl, Charles, Sophie and later also me) delivered 4,287,307 emails during the campaign and reached a targeted audience of more than 1.7 million via social media and Google ads. That’s on top of billboards and radio ads, lawn signs, stickers and traditional media – 171 stories in 25 outlets, in both official languages. 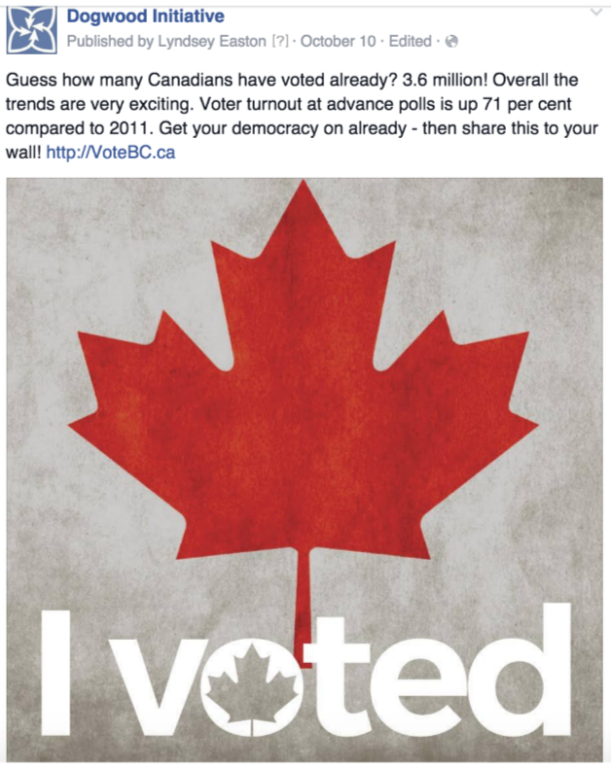 This “air war,” built around our VoteBC.ca election website, focused on arming voters with information about their local candidates: who they were, where they stood on our issues and how they were doing in riding-level polls. Then as early voting drew near, we switched gears and deployed every technique at our disposal to make sure our supporters got out to cast their ballot. All of this was happening on top of Dogwood’s get-out-the-vote efforts in the field, led by 854 volunteers across 19 ridings. Together these air and field programs represent the largest GOTV campaign our organization has ever run. If you heard from us a bit too much, that’s why and I’m sorry. If you’re still interested in how this kind of thing works, here’s some more stuff we found out! One thing that became brutally obvious in the course of this campaign is just how badly Facebook has choked off organic traffic. Why? So you’ll pay them money to reach your own fans! In 2014 our average reach on a post was 8,372 users – and that was already way down from earlier years. In 2015 the average reach was 3,548, a drop of 58 per cent. That’s why we set aside some money to boost posts now and then (you’re welcome, Zuck). Aside from voting itself, what was our most viral topic during the 2015 election? Government spying. Two of our organizers, Celine Trojand and Terry Dance Bennink, served as witnesses in a complaint we lodged against CSIS and the RCMP for illegally spying on Dogwood back in 2013. When the Security Intelligence Review Committee closed the hearing to media and the public – then put our lawyer and witnesses under a bizarre gag order – our social channels lit up. Other gleanings from the spice mines? Twitter has never been a big driver of traffic for us in campaigns, but the deeply unprofitable microblogging platform surprised us this year. We picked up 2,625 visitors to VoteBC.ca through @dogwoodbc and other Twitter users – more than two per cent of total traffic. Be still my heart! One final tidbit. We tested a lot of different image and text combinations using Facebook and Google ads. What image generated the most clicks? Stephen Harper’s face paired with a big ol’ oil tanker. 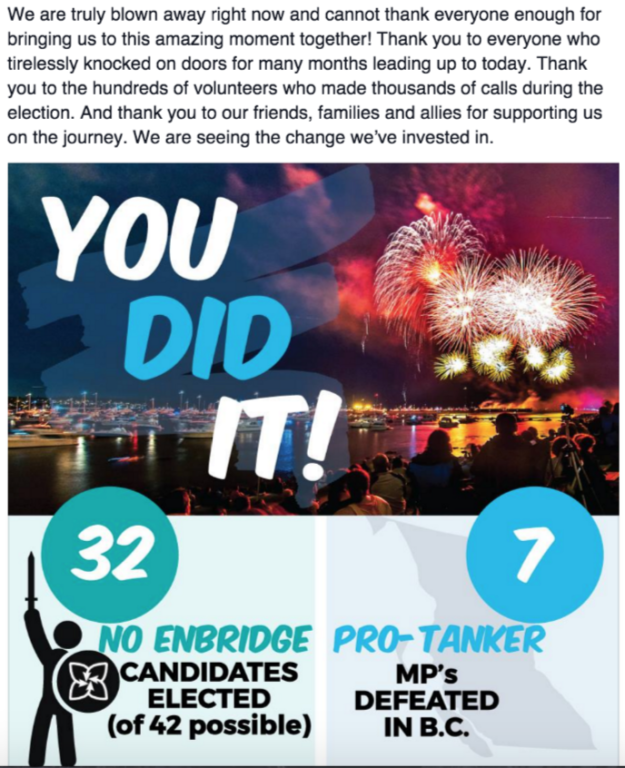 We used that design in our billboards because it consistently outperformed other images, such as a collage of organizers or a beautiful coastal landscape. But later in the campaign, Stephen Harper lost to a shark. If there’s a lesson here, perhaps it’s that humans are just a bunch of terrified monkeys with smartphones. With 179,683 B.C. 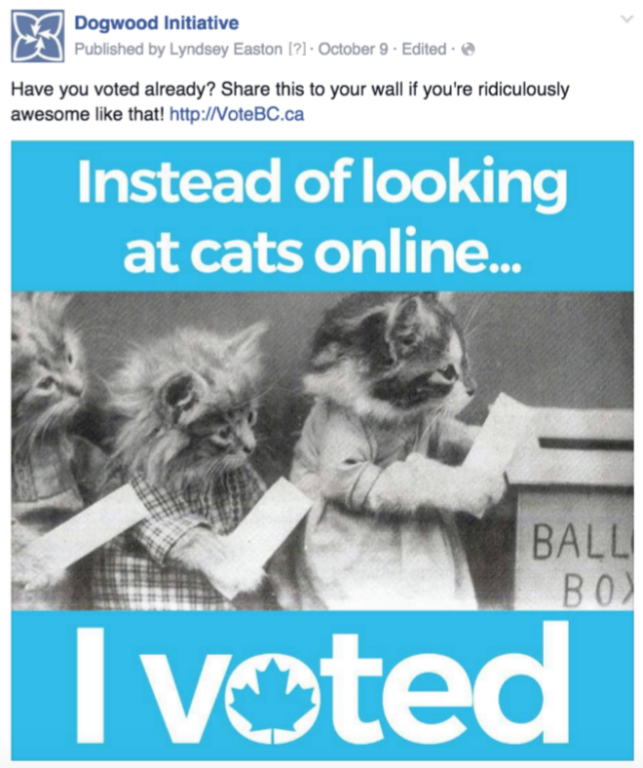 supporters opted into our email updates during the 2015 election, this was our most important communications channel and the biggest driver of traffic to VoteBC.ca. We sent (brace yourself) 124 different emails during the campaign, with an average open rate of 18 per cent. By far the largest number of messages we sent were requests for people to volunteer or attend in-person events, which are difficult asks. This pushed our click-to-open rate down from an average of 12.2 per cent to 5.6 per cent during the campaign. But strengthening our field program was worth it. At Dogwood we test four different subject lines for nearly every email that goes out, which is why you and a friend might get the same email with two different headings. Once we have a large enough sample size to pick a winner, we send the best-performing subject line to the rest of the list – which is how we found out about “!!!!!!!!”. This election reinforced some truths about email that should be intuitive: the more local, immediate and personal the subject matter, the more likely somebody is to open it and take action. By segmenting our list and tailoring subject lines and content to local audiences, we were able to achieve open rates on some emails as high as 65 per cent. Who was the most engaged? Voters in the riding of Courtenay-Alberni. What performed the best? Polling updates. Over the months we commissioned 23 separate riding-level polls from Insights West in nine ridings. They were the only local polls in the province conducted using live phone interviews. In the end our pollster predicted the winner in eight out of nine – and correctly called the popular vote in B.C. to within one percent for each party. These promises (and hundreds of others) didn’t spring out of nowhere. They’re the cumulative result of years of work and millions of conversations by advocates all over the country and the political spectrum. Now our job as issue-focused, nonpartisan folks is to make sure the government follows through. Sounds pretty clear to us. We’re waiting to see how this shakes out in the New Year, and what the government does with the NEB’s recommendation on Kinder Morgan. The hearings in Burnaby are going to be fun. At the same time we’re going to be filming an in-depth piece about the North Coast tanker ban, hiring a couple of new communications staff – and redesigning our website to better reflect the province-wide, people-powered political powerhouse we hope to grow into. Most importantly, Dogwood is getting ready to launch a brand-new campaign. You can submit your ideas here between now and January 12th. Thanks for your support so far. Check back with us after the holidays, because things are only going to get more interesting!